An evolutionary perspective on these revolutionary times...plus a little whimsy. WELCOME TO THE GREEN PEN! It's my personal soapbox, a place for me to express thoughts and feelings, musings and rants, reflections and recollections; to have fun with words -- about things spiritual, environmental, social, political, economic, and, from time to time, personal. And of course about peace. Soapboxes are in public places (as London's legendary Hyde Park) on purpose, and so I invite conversations with you, for it is through civil discourse that we can gain some perspective on the seeming chaos of these changing times and learn together how to shape a positive future for ourselves, our communities, and the generations to come. I recently read the book, The Sword of the Lord: The Roots of Fundamentalism in an American Family by Andrew Himes. Whatever your personal views are on American Christian Fundamentalism, Andrew Himes' The Sword of the Lord is a must read on many levels for anyone interested in understanding a little more -- a whole lot more -- about U.S. history, particularly about one of the defining elements in how we came to be who and what we are today as a nation. It is a gripping story. On the one hand, The Sword of the Lord, is a very readable account of the rise and continuing evolution of Fundamentalism as a Christian sect in America, reaching back hundreds of years to the Black Plague that swept across Europe and right up to the day Himes laid down his pen (or lifted his hands from the keyboard) in 2010. The story touches on the colonization of this continent, the writing of the U.S. Constitution, slavery, the Civil War and Reconstruction, the Scopes Trial and evolution, the Ku Klux Klan, Jim Crow segregation, and the struggle for civil rights. It clearly describes the philosophical, historical, and very human contexts that underpin and motivate the origins, rise, and spread of American Christian Fundamentalism and how it has changed over time. 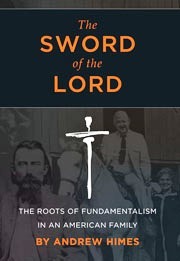 At very the same time, The Sword of the Lord is the story of an American family --Himes' family -- and its intimate role over many generations in the development of American Christian Fundamentalism, and one man's (the author's) rebellion against it and ultimate coming to terms with it. Worth 6 stars! Available on Amazon, where almost all Reader Reviews give it 5 stars. And just to be transparent about it, I would have given it top ratings even if Andy Himes weren't a friend and colleague in the peace movement. What's Next for Dennis Kucinich? Copyright 2011 Michael Abkin. Simple theme. Theme images by luoman. Powered by Blogger.